The signage examples here of printed event signs and barricade signs are excellent and show you the scope of online work Signs Banners Online can provide for you. When measuring your desired sign size keep in mind that ties and loops are used. Many people order 2" less so that on the day the install deploy team can quickly set the banners. Long event barrier covers & signage printing also make it cheaper for customers because logo repeat can be utilized and saves production time vs. cost. A step n repeat logo wall when made long span also looks better than individual barrier jackets for your crowd barricades and covers. Crowd control barriers. When you make the step n repeat event sign LONG, it prevents people 'judging' a hole in the barrier/fence and them thinking they can just slip through. A full length sport sign is always better for crowd management and the sponsors like it bigger too. Barricade vinyl banners are expensive. It is better to use poly fabric semi mesh. This offers you a cheaper and more versatile option. Plus, when eventing the deploy dismantle is easier, it can be folded and stored better and is lighter. The colors are amazing so vibrancy and readability is not a concern AND the Sports material is not reflective so it looks better on TV and photography. Event management professionals prefer it. 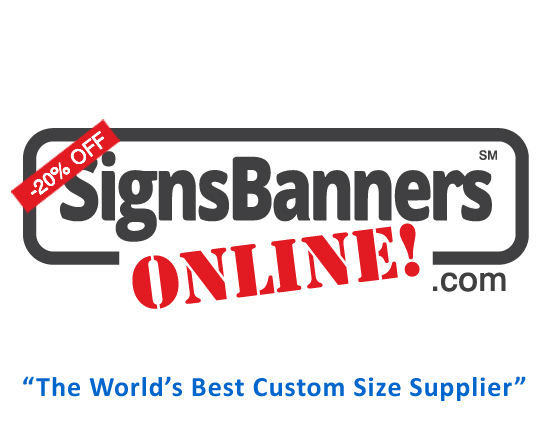 For supplies https://www.signsbannersonline.com specialize in the large format printing and custom size event signs as used on portable barricades used for eventing and crowds. They supply excellent products and are the cheapest. Their experiences shows for sports and public crowd management promotions. Security control barriers: If you are intending to hire or use the popular security crowd control barrier from your local supplier please ask them for the best sign size as they all have slightly different nuances and features, sizes and spreads. https://www.signsbannersonline.com/eve... gives you more insight how to measure for the perfect event fence. I used a strong wall flat panel system and clipped the signs to it. They are right, soft signage is a better option than vinyl. Longer printing means that your signage outdoor is seamless and looks better. Works excellently with plastic barriers too! I followed their advice and received a perfect set of banners. It was easy to attach the signs and wall of the area, breakdown and store for next event. I recommend it, the sponsors are delighted. Visual communications make such as strong impact.